Roughly the same size as Europe, the United States of America covers an area of 9.834 million square kilometres and is home to 319 million people (half that of Europe). Consisting of 50 different states, each of which has their own laws, taxes, climates and cultures, the US is a diverse nation. When we talk about moving to America there are many generalisations which can be applied whether you are planning to live in Boston, Sarasota or Oregon; however, there are also many specific considerations applicable to each state. 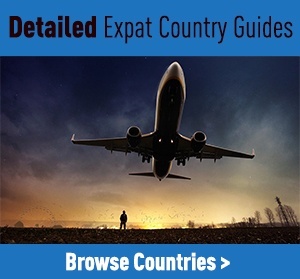 In this guide, we will cover the best advice for moving to America and look at some of the most popular places to live in the USA as an expat. 1 Why Move to USA? According to the MoveHub’s 2016 Global Migration Report, America is the second most popular place for Brits to emigrate to. Offering such diverse ways of living combined with huge choices in destination, climates and affordability the USA is rich with opportunity for anyone seeking a new way of life without sacrificing modern comforts or standards of living. Many places in the USA offer similar or a higher quality of life whilst delivering the benefits of lower living costs. An English-speaking nation that has much in common with the UK lifestyle, America delivers familiarity to expats from entertainment and popular culture to business practices and lifestyles, there is not much to compromise on when considering a move here. In many respects, America can offer Brits with more than they can get at home; bigger houses, better cars, more space and, depending on the area, higher salaries and a better climate. At best, America is a six-hour flight to the UK (Boston to London) yet the accessibility is far greater than locations within Europe, Middle East and Asia. Every US city has regular flights to all major UK airports and most at affordable prices making visiting the UK to see family and friends an easy prospect. Valid for up to two years, most visitors from the UK can apply via the ESTA system as part of the Visa Waiver Program (VWP). To do so, you must hold a machine readable or ePassport. Access to the USA under the VWP is restricted to visitors only and entitles you to stay in the USA for up to 90 days at a time or a total of 180 days in any rolling 12-month period. Unlike other immigration programmes, US border control does not require you to have a minimum length of validity on your passport and will entitle you access up to the date of expiration. You will be ineligible to use a visitor’s visa if you are intending to work, study or remain in the US indefinitely. You will also need to seek assistance with visa entry if you have a criminal record, have been arrested and not charged on a criminal offence or have a serious communicable illness. If you have travelled to certain areas, including Iran, Iraq, Sudan, Syria, Somalia, Yemen or Libya, since March 2011 then you will need to contact the local US Embassy for further information. Obtaining a visa to work in the USA can be a complicated drawn out process which needs to be taken in advance of your starting employment. Intra-company visas are issued for employees transferring from a related foreign company to a US parent company and are usually valid for 12-36 months but can be extended for up to seven years (executive/managerial staff – L-1A visa) or five years (specialist knowledge staff – L-1B visa). Valid for three years, employment visas are issued to professional level candidates holding a US bachelor’s degree or equivalent who have an offered position within a US company. Your employer must provide details of your employment contract and should normally apply for the approval six months before the visa is required. Current immigration laws restrict the number of employment visas issued each fiscal year so competition for these places is high. At present, just 140,000 places are made available each year with a proportion of these being offered only to those candidates who have an advanced academic degree from an American institution. Employment visas are offered on the basis of priority workers, professionals holding advanced level degrees or having exceptional ability and t hen skilled workers with unskilled workers taking the lowest priority before exceptional immigrants such as ministers of religion, Iraqi and Afghan citizens who have worked on behalf of the US Government. Students can obtain a study visa when attending a US institute of learning, the F1 card. They can also bring their spouse and children in on the attendant F2 visa. Visas are available for volunteers who work in the country without receiving payment and are usually valid for 12 months. You will need to provide full details of the organisation you are volunteering for as well as provide documentation about your assignment. You will be asked to attend an interview at the US consulate before you are granted permission. There are no official options for retiring to the USA from the UK however investment can offer an opportunity to circumnavigate the usual residency rules. Retirees who have at least $500,000 to invest can obtain residency through the EB-5 visa. If you have a member of your family who is an American citizen, then residency is a simple process of their sponsoring you. They will need to provide confirmation that they are able to support you (up to 125% above the poverty line) as well as proof of their own citizenship. The other alternative is to be sponsored by your employer who must provide proof of the value and exceptional nature of your contribution to the workforce. They are often required to provide evidence as to why your role cannot be filled by an American and that in hiring you does not adversely affect wages of other US citizens in similar positions. There are plenty of forms to complete as well as interviews to attend along the way and the process can take up to two years to complete with no guarantees over the outcome. Bizarrely, the US also runs a ‘Green Card’ lottery scheme aimed at providing an opportunity for those countries that are underrepresented. With 55,000 places available most UK citizens will not qualify due to the UK not being an underrepresented nation but those that were born in other countries may well meet the eligibility requirements. Obtaining citizenship is a process of first acquiring residency in the USA. After a period of five years (of permanent residency) you must then complete the naturalisation process which incorporates a demonstrable written and oral English tests, a basic knowledge of US history, government and civic principles as well as being of upstanding moral character. Candidates must also demonstrate their attachment to the beliefs and ideals of the US Constitution. Despite being similar in many ways to the UK, the USA offers many surprises to Brits when it comes to some aspects of daily life. Firstly, let’s take a look at America’s gun laws. The infamous Second Amendment which allows citizens to bear arms is quite alien for Brits to get their head around. Whilst we are aware of the laws enabling people to carry guns the fact that 35-50% of the population do so (Source: NY Times) is alarming. Whilst headlines do carry regular incidents of shootings they aren’t as widespread as the British Media would lead you to believe. Most Americans believe viscerally in their right to carry arms and do not appreciate objections raised by outsiders on the matter. To keep out of harms way, you should educate your children about the dangers of guns which can be particularly pertinent if they are visiting the homes of other families. Another big difference between the two nations can be seen when it comes to walking vs driving. Here in Britain, perhaps because we have a smaller country, we would think nothing about walking half a mile to a supermarket to pick up a few bits and bobs; in the US, perhaps because of the low cost of fuel or the greater distances to cover, that same trip would most certainly made by car. Walking in the states is done for the pleasure of doing so in picturesque surroundings and not widely by choice. On the reverse side of this, driving in the UK for a few hours will take you to most regions. From Birmingham, for instance, you can reach either the east or west coast in under three hours. In America, road trips are a way of life and it can take several hours to drive across a single state. Religion and patriotism play a huge part for Americans; the latter is almost entirely true of the whole population with the former being more localised across different states. As a result, it is important as a newcomer to the country to be respectful of both faith and national pride. The American Flag for instance is an icon that is treated with the utmost of respect and desecrating it is viewed by many as a gross form of disrespect. What may not come as a surprise if you have ever visited America is the propensity with Americans to be extremely friendly and welcoming. Whilst this may seem like a stereotype, it is based on certain truisms particularly with Brits moving to the USA. Americans love their country and are usually very welcoming towards the British. Shopping for weekly groceries in the USA is an eye-opening experience for most Brits. Not only are the supermarkets much larger than our own but the sizes of the products and packages are also much bigger as well as being available in wider varieties. Whilst most of the products you find in the UK will be available, be prepared in certain locations to make substitutions. There are still plenty of goods for which you won’t be able to find a suitable alternative easily but there are options available (see our guide on Buying British Groceries Online). There are no states in the US that have particularly conservative views on dress codes and a Western wardrobe will suffice in most areas. The only things to consider are generally associated with the prevailing climate of the state you are in with winter in the northern and eastern states being particularly cold. Casual wear is acceptable in most situations yet formal occasions will require smart dress. Because of the size of most cities and states, owning a car is essential when living in the US. Fortunately, the cost of owning a car is not prohibitive with low fuel and ownership costs. Insurance as a foreign national may be more expensive until you qualify for an American driving license. Highways are well maintained and due to them being several lanes wide are not normally congested except around major cities during rush hour. City driving, particularly in places like New York should be avoided and the public transport system of the subway and buses and taxis are more than adequate to get around quickly at a low cost. Domestic air fares are reasonable if you need to get across the country quickly but train fares are lower and offer a great way to travel at high speed whilst taking in the sights. Many people also choose buses as a cheap alternative to cross-country travel with one way tickets costing anything from $25 for a seven-hour trip (Boston to Washington). The weather across the USA varies significantly from states in the north and east of the country experiencing four marked seasons from bitter winters, mild springs and autumns and pleasant summers to states like Arizona that are dry and arid all year round or Florida that enjoys temperate conditions but experiences hurricanes from August to November. The cost of living across the USA varies on a wide range depending whereabouts in the country you are looking to live. From high cost living in cities like New York or Los Angeles to exceptional value in places like Orlando, Florida or Memphis, Tennessee there is much to distinguish communities both in cost and quality of living. To give you an idea of comparisons, we’ve taken five sample locations from our list of popular areas to provide indicative figures as to the cost of living compared to Birmingham in the UK. Rental prices in all of our test locations were higher than our benchmark city of Birmingham with Sarasota coming out cheaper than the other US cities and San Francisco being the most expensive. Sarasota fares the cheapest across the board with San Francisco being the most expensive. With one or two exceptions, travel expenses are cheaper across all our test locations than in Birmingham. Once again, Sarasota comes out at the lowest cost with Boston being the most expensive. Education facilities vary dramatically depending on the state and area you are considering; however, the USA overall has a good school system which, just like the UK, has failing and outstanding institutes. The education system is typically comprised of elementary school (kindergarten to 5th grade or age 5-10), middle school (6th to 8th grade or age 11-13) and high school (9th to 12th grade or age 14-18). Enrolment in state funded schools is down to application by district. However, private and international schools are widely available in most major cities and give a more diverse choice in the type of curriculum which is followed as well as offering options on the types of qualifications gained. Higher education also varies by state and locale but America is home to six out of ten of the world’s top ten universities. Schooling costs in the US do vary greatly depending on the state and the type of institution that you are looking at but are comparable to the UK in fees. Around 750,000 Brits now call the USA home and are spread across this vast country from east to west coast and from the borders of Mexico in the south to Canada in the North. Drawn to everything from the isolated terrains of Nevada to the characterful communities of Louisiana, the urban megacities of New York and Los Angeles to picturesque New England, Brits are everywhere. However, there are some states, cities and towns which tend to attract more people from the UK than others and with obvious reasons. Voted the best place to live in the USA by News and World Report, the capital of Colorado boasts a strong jobs economy, low crime rate and excellent standards of living. Situated in the middle of the US, an hour’s drive from the infamous Rocky Mountains, the Mile High City also has great schools, world-class universities as well as a great climate. The average salary in the city is 12.3% higher than the national average with unemployment 36.7% lower (just 3.1% of Denver residents are not in a job). The recent decision by the State of Colorado to legalise recreational marijuana has opened up enormous new opportunities for industries. In 2015, the state recorded sales of $996.2 million of cannabis making the market extremely lucrative. The city is home to a thriving arts and entertainment scene creating a vibrant cultural environment to enjoy leisure time. The proximity to the mountain range offers year-round access to outdoor pursuits such as skiing or hiking in places such as Aspen and Vail or the numerous National Forests (White River, Gunnison and Arapaho). Colorado Springs, just an hour south of the city is one of the most picturesque cities in the region and offers glorious views of iconic red sandstone formations against the snow-capped landscape of the mountain range. Brits living in Denver have a host of opportunities to meet other British expats with clubs and events running across the city from football supporters groups to socialising meetings, there is plenty to choose from. Also known as the ‘Cradle of Liberty’, is one of the oldest cities in the US; founded in 1630 when puritan settlers arrived from Britain. Of all the cities in our list, Boston has the most English feel to it and is partly due to its long connection to the cross-Atlantic brotherhood with which the US has its roots. Named after the Lincolnshire town, Boston is also twinned with Belfast in Northern Ireland and is home to a large number of migrants from this part of the United Kingdom too. The architecture of the city is colonial in style and incorporates charming museums and galleries, antiquated bookstores and independent boutiques as well as pubs and coffee houses that appear to have been ripped straight from a 17th century tome. A city more defined by its academic prowess than most, Boston is one of the country’s most famous seats of learning, Harvard University. The population boast a higher than average intelligence and the city is also home to some of America’s finest research and teaching institutions. In turn this has attracted the investments of some large corporations keen to exploit the wealth of an educated population. Jobs are therefore well-paid and there are plenty of employment opportunities in sectors as diverse as technology and medicine, research and academia as well as creative sciences and modern languages. Property is expensive in the city and can be difficult to find as competition is high, particularly for old architecture combined with retro-fitted modern living. With good schools, attractive property and high standards of living the average salaries are commensurately good which is just as well because Boston has one of the highest costs of living in the USA. Boston has much to offer its residents from numerous biking, hiking and running trails across the city for those with an active lifestyle to arts and cultural events as well as pubs, clubs and restaurants for all. The cuisine in Boston is characterised by the city’s seafaring past and seafood can be found on almost every menu in town. Sport plays a big part in the social lives of Bostonians with most following the local teams of the Celtics, Patriots or the famous Boston Red Sox. Overall, the charm of Boston invokes an era of days gone by with a touch of European elegance and old word ambience. It combines this with a prominent economy and modern outlook which embraces the American dream making it an ideal location of Brits to move to. Situated in the North-west corner of the United States, Seattle has a reputation for experiencing a lot of rain but is not nearly as wet as you would be lead to believe, particularly in comparison to parts of the UK. Average annual rainfall in the city is 96cm which compares reasonably to the North of England whilst Glasgow receives more than its fair share at 112cm or Cardiff at 115cm. The city benefits from exceptionally clean air, a result of its location surrounded by mountains and water, and is in the top ten most sustainable and environmentally friendly cities in the US. Jobs are abundant within both traditional sectors such as technology, banking and healthcare as well as service, marine and manufacturing industries. Average annual salaries are high at almost $60,000 with no personal income tax; however the state of Washington has one of the highest combined state and local sales taxes in America at approximately 8.9%. Real estate taxes are average with the State of Washington ranking 27th with an effective tax rate of 1.08%. The city’s economy is stable and has an affluent and well-education population that contributes to an atmosphere described by expats as ‘calm and patient’. Close to the Canadian border with Vancouver being just 142 miles north, Seattle is eight hours ahead of GMT and is a 10-hour flight from the UK. The location is quite remote from many ‘popular’ destinations in the US but is a self-sufficient state benefitting from excellent transport links, a vast range of leisure activities and a diversity of cuisines, cultures and ethnicities. The city has a reputation for the arts and hosts an eclectic mix of annual festivals and fairs across the arts and sports. Washington state is also home to some unique natural wonders including the active volcano, Mount St Helens, the glaciers of Mount Rainier National Park and the stunning Puget Sound, famous for its whale watching and salmon fishing. The job growth rate of Portland is around 2.9% per year and the city offers a wealth of employment opportunities in the technology sector as well as shipping, manufacturing and the steel industry. The area has also become a hub for sportswear industries and is home to the international headquarters of Nike, Adidas, LaCrosse Footwear and Hi-Tec Sports. Nike alone employees 6000 people and citizens of Portland rely heavily on these multinational corporations for local jobs. The city has a population of around 650,000 people and has a higher than average rate of academic degrees per populous. Education facilities in the city are excellent and there are several private schools offering a range of curriculums. Higher education also has a strong reputation for excellence with Portland State University being in the top fifteen percentile in the US for undergraduate education. Also known as Bridgetown, Portland is situated on the Colombia and Willamette Rivers and enjoys a backdrop formed of mountain views from the cinder cones of Mount St Helens, Mount Tabor and Mount Hood. The surrounding area is well known for its forests, parks and green spaces and is a popular location for cycling and hiking. The city itself is home to some beautiful open green spaces including Washington Park, Marquam Nature Park and the Smith and Bybee Wetlands. Known for its quirky residents that celebrate the weird, Portland has a host of interesting independent shops and has a thriving arts scene. As a result, the city attracts creative people which can be seen in the live music acts, performing arts venues and galleries across Portland. Welcoming of diversity, the city has the 7th largest LGBT community across the US; interestingly the city is also reportedly the least religious city in America with just over 42% of its population identifying as religiously ‘unaffiliated’. A great place to raise a family the city has many suburban areas, each distinct in character and offering quality accommodation at affordable prices. Quality of life is very high and is ranked 7th in the US overall. Known as the Green Mountain state, Vermont has some dramatically beautiful landscapes with Burlington at the centre of this little piece of New England. Situated at the border with Canada, the city is just an hour and a half’s drive from Montreal and sits alongside the stunning Lake Champlain. A small city by American standards, the draw to this area is the unique blend of cosmopolitan modernity blended with the charm of traditional character. The surrounding area is great to explore and offers great driving through picturesque covered bridges (Vermont has more than 100), hiking along the Appalachian Trail or a boat trip on the lake to the Champlain islands. Burlington has low crime rates, excellent job opportunities and is a great place to raise a family due to its excellent schools. The standard of living is high and there are plenty of ways to keep entertained from cultural explorations, adventurous excursions and educational journeys as well as access to clubs, bars and restaurants as well as excellent shopping facilities. An agricultural state of small farmers Vermont has an abundance of small markets offering a great range of local produce. Its location to the North East of the country (and in common with New England in general), Burlington experiences marked seasons with cold and snowy winters, mild springs and glorious summers; not to mention the crisp and decadent autumns that characterise this part of America. Brits will enjoy the smaller town feel of Vermont whilst benefiting from all the major facilities of a city. The added advantage of being so close to Canada are, of course, the extra travel opportunities plus being just five hours behind UK time. With the roots of New York inextricably linked to America’s immigrant past, there is no one city that so iconically defines the US. Perhaps it is the city’s ceaseless portrayal across popular culture mediums like film, television and music but New York city epitomises American city life for most Brits. The city itself is expansive and comprises five boroughs, each with their own distinct character; Brooklyn, Manhattan, Queens, the Bronx and Staten Island. The hub of global business and commerce and home to the New York Stock Exchange, high rise lower Manhattan plays a huge economic role for the USA as well as globally. Real estate is a major part of the city’s income but so too is banking, technology, design and tourism. Food processing, manufacturing and advertising also contribute to the healthy economy in the city. As a result employment is high in New York as well as being incredibly diverse. The Big Apple is home to over 8.5 million people (the same as London) in an area three quarters the size of the UK’s capital city. With a reputation for being the place that never sleeps, New York City is a busy capital that plays host to inordinate numbers of tourists on top of its huge population. Renting is expensive and many residents choose to commute into the city rather than pay the extortionate fees charged for small apartments. Rye in New York has a large British expat community and is even named after the small seaside Kent Town in the UK. An affluent area, the average income is $110,000 making the residents who call it home at the upper end of the pay scale. As well as being home to Brits, there are also plenty of other Europeans, Australians and New Zealanders in Rye. However, the local Post Road Market has been seen to pander to the British tastes in the area and stocks Cadbury’s chocolate, black pudding and is one of a few places in the area to be able to get copies of British Magazines as well as the London Sunday Times and Irish Independent. Commuting to New York from nearby Hoboken, New Jersey has also become a popular location for young professionals working in the city. With high state personal income and real estate tax rates and average combined sales tax rates the cost of living is already high. Consumer goods and personal items vary in cost but remain higher than average across the US. Crime rates in the city itself are high but suburban neighbourhoods can vary greatly so research is important before committing to any one location. Florida is one of just five states in the USA that does not collect any income taxes which, combined with a healthy employment market, helps to make Sarasota a popular location for expats. Quite aside from the obvious draws of the stable and warm climate, glorious sun kissed beaches and friendly population Sarasota also has a thriving cultural and arts scene. Employment is strong in the city with the most job opportunities being found in the education, hospitality and leisure industries. However, there is a diverse mix of start-ups coming out of Sarasota across a range of sectors providing innovative and creative investment opportunities. South of Tampa on Florida’s Gulf Coast, Sarasota is home to a small population of just 60,000 residents. Geared towards a huge domestic and international tourist industry as well as retirees the city offers as much in the way of entertainment and nightlife as it does public amenities for comfortable living. The schools are good, standard of living high and maintains excellent leisure facilities. As well as sailing, water sports and fishing, golf is particularly popular. The property market is reasonably buoyant and has experienced growth in line with the average rates. The median average house price in the Sarasota area is currently $273,000); this compares to the national average of $192,500. Rental prices are lower than the average of $1,945 per month (3-bedroom apartment) at $1,780 per month. The British expat community in Sarasota consists of a high proportion of retirees but those that cover wider areas such as Bradenton, St Petersburg and Tampa do cater for younger expats as well as professionals working in the area. Many Brits fall in love with the city of Kissimmee whilst on holiday. Situated just south of Orlando it is a location best known for its proximity to Walt Disney World. Just a short seven hour flight from the UK and benefiting from cheap flights much of the year, Kissimmee offers plenty of cheap accommodation, a low cost of living and, outside the tourist season, a relaxed and peaceful way of life. The English in particular have made large pockets of the area home and have started businesses such as pubs, motels and restaurants all of which help to define the expat community. With names like The George and Dragon, The Cricketers Arms, George and Dragon and the Chippy they are not hard to spot. The area draws mainly retirees as the employment market is quite restricted to the tourist and leisure industries making working here a competitive business. It is more common for Brits to buy property in which to live using a visitor’s permit for six months each year and renting their homes to tourists during the peak seasons. Nevertheless, the city is still a popular community and there are plenty of permanent residents here who once hailed from the British Isles. The state capital, Austin is growing at a rate of around 50 new residents every day with a handful of these being British. The city offers a great quality of life as well as lucrative job opportunities amongst its wealth of industries including technology, engineering and pharmaceuticals. Unemployment levels are reasonably low with higher than average salaries and the city ranks one of the top areas for venture capitalist investments in the United States. Texas is also one of the few states in America where residents pay no personal income tax; however, property tax is disproportionately high. Though this can work to your advantage with only five states having a lower overall tax burden than Texas, it is worth looking into the implications of this with a financial advisor. The city has long been associated with music and there are plenty of live music venues, festivals and gigs to enjoy this aspect. In addition, Austin hosts several national and international film festivals, sports and arts events. Culturally, the city is diverse and the local motto, ‘Keep Austin Weird’, is a celebration of the eccentricity that thrives here. Independent shops, businesses and communities flourish in this vibrant and colourful city. There is plenty to do in and around the city including kayaking, hiking, swimming and rock-climbing as well as taking advantage of the numerous entertainment venues, restaurants and museums. Austin has good schools and is the 16th most literate city in the US, being voted America’s No 1 College Town. There is an excellent network of international and private schools as well as hosting a community of home schoolers and those committed to ‘unschooling’. Expats find Austin to be a welcoming city that offers great opportunities for both single and family life and there are plenty of British expats to share experiences with. Having long been a popular destination for British migrants to the US, San Francisco has a charm and beauty that is wholly unique to this west coast Pacific tourist trap. Home to iconic landmarks such as the Golden Gate Bridge, former penal island, Alcatraz and of course the cable cars that traverse the dizzyingly steep hills. With its synonymous history of liberal politics from the sixties and seventies there is a romantic notion about San Francisco which has endured. The city remains one of the most progressive and enlightened places to live in America celebrating diversity. Residents are tolerant of newcomers and expats find a warm welcome to this city. At 1,365 sq. km, San Francisco (and Oakland) is smaller than London but has just 3.2 million residents instead of 8.2 million. The reduced density is evident when you spend time here and manifests itself as a cleaner and quieter city in which to live, despite being such a popular tourist destination. The property market in San Francisco is booming with average house prices in the city costing over $1.1 million. The desirable Victorian houses which make up a large percentage of the main city attract even higher prices and most expats choose to live in the suburban districts of Novato or Walnut Creek. Both neighbourhoods have excellent facilities, particularly for families. Young professionals and singles may prefer the trendier and more lively districts of Bernal Heights or the area known as SOMA (South of Market). The former is typified by boutique bars, trendy cafes and bohemian living whist the latter is the epitome of urban chic. Close to the Museum of Modern Art and surrounded by fashionable clubs, SOMA is populated by international foreign nationals who want to be close to the city for commuting to work. The residential areas are a mix of modern developments and renovated warehouses. The British community is evident in a lot of the city’s bars but none more so than in the Pig and Whistle or You Say Tomato. Head down to the beach on November 5th and you will run into large swathes of the expat community celebrating Guy Fawkes Night with a bonfire. San Francisco has a lot to offer its residents and is one of those places in the US where you instantly feel an attachment. The bay city does have higher than average living costs particularly with California’s income and combined local and state sales taxes. However, average salaries are over $64k with plentiful job opportunities. Whilst us Brits are occupying every city across the USA, there are states and cities that attract more expats than most. These have been covered in detail over the previous sections but in general New England, California, Texas and Florida tend to be the prime locations for the majority of Brits in the USA. Every state has its own British expat community with some having dozens to cater for the greater numbers. In Florida, particularly around Orlando, there are groups that cater for every aspect of social networking from sports and leisure activities to cookery, book groups and martial arts events. Whilst you may not find it necessary to get involved with an expat community they can provide a useful source of information when it comes to issues that are peculiar to Brits living in the states. Talking to others about matters relating to taxes, visas and schooling can be very informative so it is well worth establishing where your local groups meet and showing your face at a few meet and greets – you never know when you will need them. Since the global financial crisis of 2007-2008, the jobs economy in the USA has largely recovered however there are massive regional variances across many sectors that continue to struggle. Its important to remember that the USA is the size of Europe and contains micro-economies within the super-economy. The USA’s economy ranks first in the world with a nominal GDP of $18.5 trillion. The outlook for the USA in 2017 is expected to produce a mild rebound before returning to modest growth rates. Consumer spending has grown in line with relative increases in take home pay and the construction industry is also enjoying a slow recovery. Capital spending is down and confidence in long term growth is still cautious. Areas that continue to experience growth are the technology, pharmaceutical and education sectors along with start-up companies filling the gap in foreclosures that happened in 2007/8. Healthcare in the USA can be notoriously expensive and is largely operated by private companies offering a range of standards in care. Visitors to the USA must provide their own health insurance as they are not eligible for access to care provided under the government Medicaid programmes. Whilst not mandatory, the potentially prohibitive costs associated with emergency treatment make visitors health insurance a sensible idea. Most companies who employ foreign nationals will make healthcare provisions available but the extent of these should be investigated to ensure that supplementary cover is not required. Generally speaking the standard of healthcare in America is exceptionally good with access to world-class treatments and the best healthcare professionals. America is an excellent place for children to grow up and offers many opportunities that are similar or better than an upbringing in the UK. Education is good if slightly different to the UK and if you are using a public school will follow an American curriculum. The differences are mainly in the style of English being taught, history being centred on the American perspective (usually covers domestic and not world history) as well as the second language of Spanish being taught in place of what is typically French for British students. Qualifications will be a High School diploma in place of the International Baccalaureate or GCSEs however, international schools do follow these courses if you choose to. The transition from the UK to USA is an easy one for children as there is no language barrier and the culture and climate is very similar to our own. Are you considering a move from the UK to the USA? Have you already made the jump across the pond?